The all-in-one bundle offered is structured to enable the building, over time, of an advanced online marketing platform. We believe the bundle to be the most comprehensive digital marketing SaaS bundle available in the world. The fast track Referral Marketing App setup and build should take a novice builder (without coding skills, but with Microsoft Word, Powerpoint and Social Media skills) not more than a few days to complete. If you have the information available, say on an existing website you could create the Reputation and Referral Marketing App in under a day. Each signed up Webo SaaS customer becomes a Webo Member whose Online Site boasts a private loyalty account for every one of their customers that is automatically created for them when the register on the Communicator App for SMS and, or for Email notification. In their customer loyalty accounts customers can save, retrieve, share and redeem coupon, loyalty or referral rewards. Because each customer has a private online loyalty account where they manage their own contact details, transactions and reviews the site is setup to be GDPR compliant. 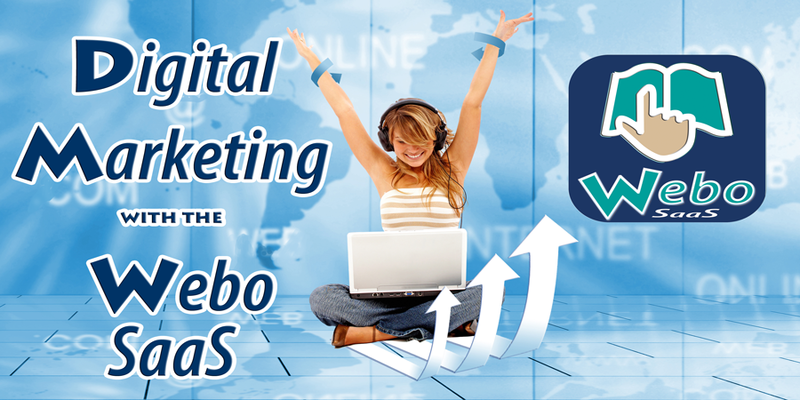 The Webo SaaS Bundle offers an amazing opportunity to Digital Markers and wannabe Digital Marketers to setup, build and drive a reputation and referral marketing campaign. We start with subscribers building a fast track campaign that is followed with the implementation of an internationally tried and tested roadmap that works for all kinds of businesses in a variety of industries and professions. Once built we brainstorm your needs and begin the journey to a comprehensive online digital marketing platform. 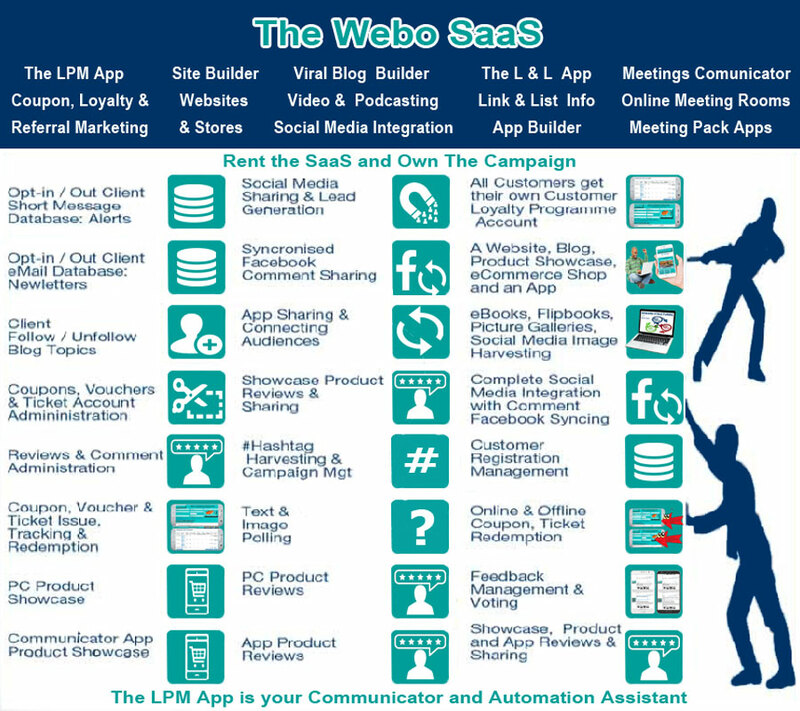 The Webo SaaS bundle includes modules developed by the specialist Webo divisions. Once the Fast Track implementation of the Reputation & Referral module is complete subscribers will be urged to implement the full roadmap (3 Phases & 9 Steps) including the 4CM (4 Channel Marketing) step. This implementation will open the door to the power of knowledge based rewards using the L & L App (Link & List App). The power of mobile connectivity is vast. The Reputation & Referral Module creates a customer community that enjoys a variety of Push / Pull digital marketing platforms. The next step, for many, to customer (community) engagement is video conferencing and the Meetings Communicator module is a pert of the all-in-one bundle. The pictures below highlight three popular modules within the all-in-one bundle. 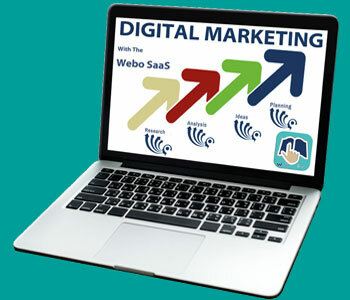 Building your Digital Marketing Platform will be an exciting journey as you explore the opportunities. Do you need to maintain growth? If you do, traditionally, you need to drive traffic to your website. The problem is that there are 1.3 billion (and counting) websites on the internet and page rank competition for keywords is intense. Couple this with keyword abuse and even highly targeted keyword searches render thousands of search results. The net effect is that many businesses are not found on the internet. Reputations and Referrals have always grown businesses and we have automated the process to enable the power of social media sharing to be reaped. It is another way of lead generation - the possibilities are staggering. Consider the following. The Webo Loyalty & Referral App puts the opportunity to share on the phones of customers. Earning an incentive plus the gratitude of a friend is only a couple of clicks away on a PC or on the phone that is in the pocket of a customer. For every 100 customers of yours, 70% will share with friends on say, Facebook where, on average, they have 338 friends. 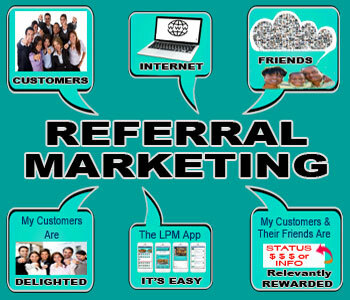 Referrals may then reach: 70% x 338 people x 100 customers = 23,660 referrals in the first step. Suffice to say that with the Webo App making it easy, customers will benefit from positive engagement via a choice of channels and they will become advisors (who write reviews) and advocates who effectively accelerate growth by sharing and by making referrals. 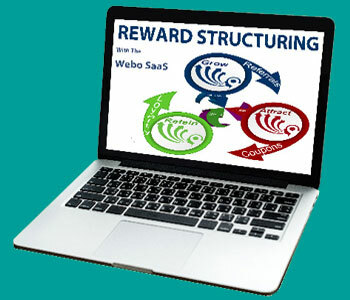 The Webo SaaS shifts the focus to lead generation via customers who share Referral Rewards with friends and business connections. 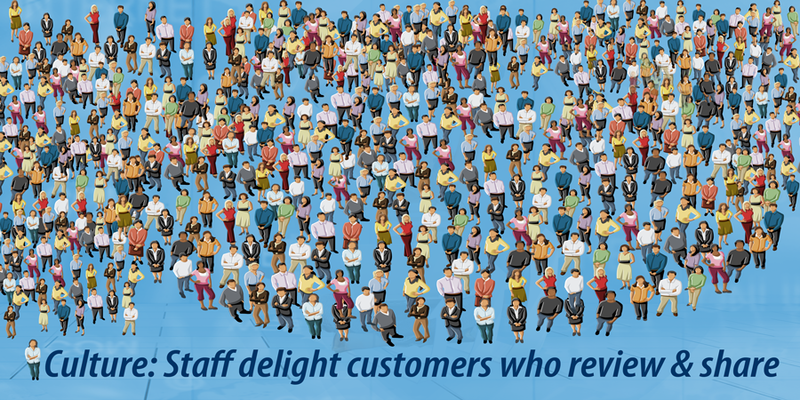 If you are not delighting your customers we recommend that you address this matter with our tried and tested Performance enhancement Programme. that will Generate some 2-10x More Leads without Tech Overwhelm. Our mantra is: Let us show you how. We could copy and paste glowing implementation testimonials on my book on Amazon but we believe that what’s been done for others is not the ultimate objective; it is what it can do for you! We offer a 14 Day Free Trial and urge you to get into the driver’s seat and let us show you how. Yes, it’s easy, you can do it. With average Microsoft Word, Powerpoint & Social Media Skills you can build a digital marketing platform, with our software, to grow your business. Commit to the FREE TRIAL now, you need not read any further and within the free trial period you will have experienced, first hand, what it can do for you. If you are ready to get started – Click Here to sign-up. Most agree that people, systems & processes, funding and culture are the foundations to business. Upon these foundations businesses struggle, survive or drive strategies to deliver defined visions. They can all afford to invest in their people. Who are they you may ask? As we have stressed, it is their staff and their customers. This is the culture that the Webo SaaS supports. People centred organisations where staff delights customers with their products and services and customers who grow their businesses. Ask yourself; do your customers grow your business? Do you want to grow your business? Is your website buried on the internet? If you answer, yes, to any of these questions signup, read no further and let us show you how you can drive along a tried and tested roadmap to a new future that is yours to plan and attain. Click here to sign-up. The Webo SaaS hardware is in the USA from where third party specialists maintain a 24/7 watch on firewalls, malware and hacking. Every Webo SaaS site enjoys this protection at no additional charge. The software is ours, built from scratch over the past 15 years. The programming office is in India; graphics and data capture is driven from the Philippines and Ireland. The Webo Academy is based in South Africa and is manned by coaches with international experience in business, the hospitality industry (Restaurants & Hotels), Manufacturing (large scale factories) and the professions (Audit & Legal). Put us to the test; signup and let us show you how to start building your own digital marketing platform on the Internet. To start you must give thought to a roadmap that will take your business from where it is to where you want it to be. We offer extensive planning assistance with powerpoint template roadmaps and comrehensive plans that you can easily edit to suit your needs. 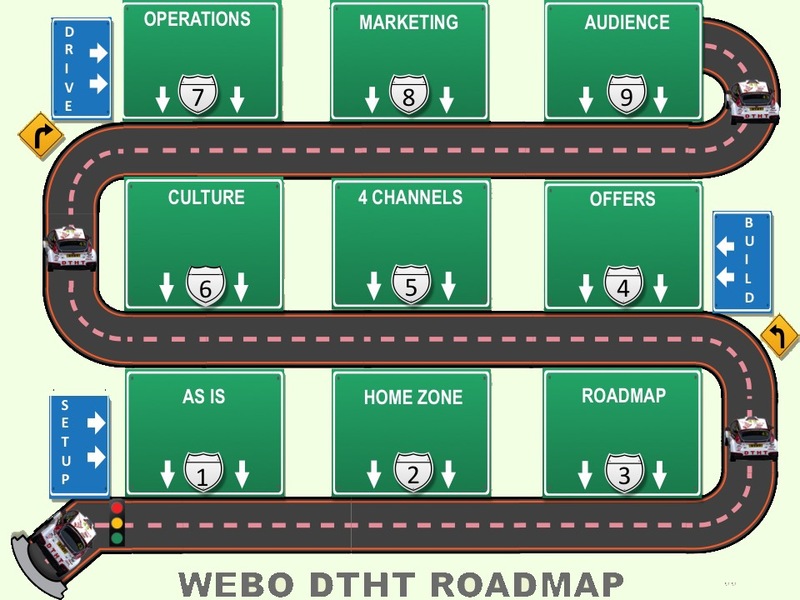 The roadmap below has three phases; setup, build and drive. Each phase has three steps. Signup and let us share with you the detail behind our internationally tried and tested roadmaps. They have worked for many and they can work for you. With your Reputation & Referral Marketing Communicator App Built it is Time To Spread The Word to Your Customers. 1. Promote your Communicator App by advocating the Coupon Benefit Rewards on your App to your customers through established marketing channels. 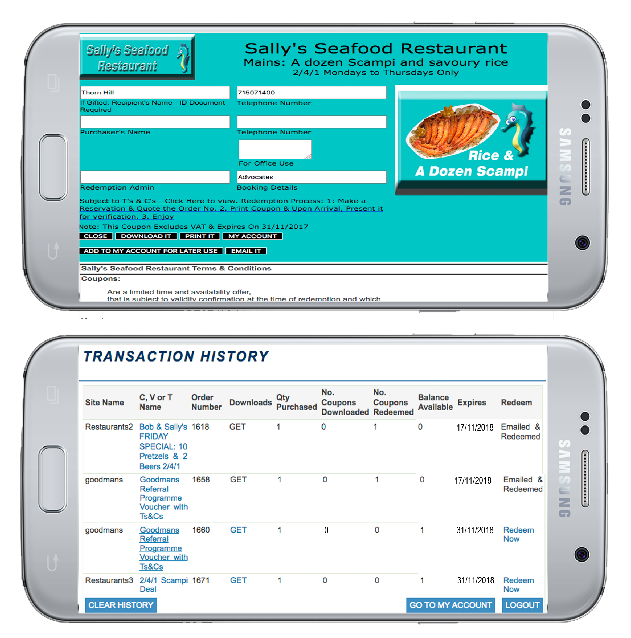 If you have a customer list, eMail the App URL and a QR code to them. Advocate your App and the Coupon Benefits to walk-in customers. 2. Customers, Friends, Browsers (Users) scan the QR code they receive or they link to the APP with the URL link emailed to them. Once the webpage is opened it can be bookmarked or if opened on a phone it can be saved by adding a Button Bookmark to the Home Screen on their phones..
3. Users tap the button on their phones whenever they desire to open your Communicator App to the latest version. No upgrades are required as it always opens to the latest version. 4. Users Sign Up or Sign In and review the latest product or service, ebook, info App, image Gallery updates, videos added, event tickets, lucky draws, listings, etc. Alternatively they add Reviews to achive Advisor Status, Share to achieve Advocate Status or they can open their Loyalty Accounts and redeem or email a coupon reward to a friend to ahieve Ambassador status. 5. Generally Coupon Rewards are issued without charge but at times an admin fee may be charged by an NGO or other entity. 6. Redemptions options may be set up to allow Print and Present and / or On Phone Redemption. If Print and Present was activated then users can print to redeem the coupon rewards which they later present to your staffer. 7. Users log in to their online loyalty accounts, select a reward in their account and hand their phones to your Admin Officer. 8. Admin Officers can enter a PIN number to redeem the coupon. They can also add loyalty points, upgrade status or activate Ambassador status re two-way rewards where both receive the reward when a friend redeems the referral reward.